Our Disability Development weeks run regularly throughout the year in Lanzarote, Spain and also throughout Europe and now Montreal, Canada. We are very excited to be launching our services in Dublin. Having these disABILITY Development weeks brings services to families which are not easily assessable or available locally. Our team will be flying in from Lanzarote with both land based and aquatic based therapy sessions taking place on a daily basis. Having sessions consolidated over the week will allow faster progression which will see benefits instantly. We will leave you armed with lots of new material, exercises and ideas to continue therapy between training weeks. You have a key contact who will be able to assist you with questions or future booking enquiries. Our unique approach is not just something that can help your child in the water but with skills that can be transferred to general day to day life. Paul Webb (also known as Paulo) if the founder and Head Coach of Swim Lab International who cater for all swimmers no matter their discipline, age and ability. 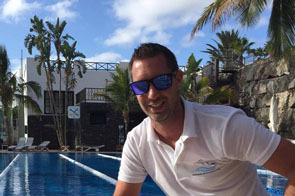 Coaching is run from various locations on Lanzarote and the UK using Open Water at Puerto Del Carmen, pools at Sands Beach Hotel and Fariones, and endless pools.